WHB with the Last Pieces of the Garden (Product Review included) | What Smells So Good? 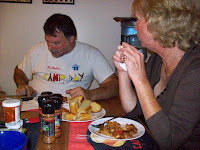 So, WHB is up again, sponsored by Kalyn's Kitchen and this weekend being hosted by Ulrike from Kuchenlatein. For this week's submission I actually didn't plan on anything, instead I was settling into inventing a recipe for my (included) Spice Depot's Always Grind Fresh spice grinders. Since I used pretty much everything in the dish from my garden (haha) to wind up with one of the tastiest things I've ma de for my family (according to my dad, "it's really good" and Martha "this is a keeper! "), I figured that sending it in to the WHB round up would be okay too. First thing's first: the spices. Let me tell you, I know I use a TON of different spices in my cooking, and I'm never afraid of flavour. When this company first contacted me with the offer to review some of their new products, I immediately jumped at the chance. There are 12 different grinders in the line, all vegan-friendly and natural (no preservatives!) and they are different from any other spice product I've tried! The flavours are as follows: BBQ Burger Seasoning, Black Peppercorns, Garlic Pepper, Hot & Spicy Seasoning, JoJo Potato™ Seasoning, New York Steak™ Spice, Salad Seasoning, Seafood Seasoning, Sea Salt, Smokey Rib Seasoning, Spicy Chicken Seasoning, and Spicy Sea Salt. They currently have an online list of distributors, but they are sorrowfully mostly Pacific-based so far. Hopefully they will be able to expand to the rest of Canada and the US, or at least set up something online, as for now I won't be able to buy from them again (I'm out near Toronto). When they arrived, the first thing I noted was the glass bottle's colourful labelling and creative names (like Jo-Jo Potato), plus the fact that you could SEE the product inside the container. Also, the caps can unscrew (which I found out the hard way when trying to unwrap o ne of the bottles and it exploded onto me, but I'm a klutz) which means they can be refilled, so you don't have to clog up your landfill. When I began using them in the recipe below, the aroma of the spices was so much stronger and flavourful than when I use my regular bottled spices. I think it must be the fact that they remain whole in the bottle until you grind them out onto your food. Think of a coarse-grind pepper mill, but with way more than just pepper. As stated, the grind is nice and coarse, allowing you to see and feel the texture as well as the flavour of the product without having to drown your food in powder. Some of these pack a serious kick, and I love it! All the grinders would be a wonderful addition to the BBQ lover's apothecary of seasonings, and yet they aren't limited to steaks, ribs or burgers at all. In fact, the full recipe I came up with (using the Jo-Jo Potato and Smokey Rib) is made on the stove-top and in the oven, and is completely vegan! I've also used their Garlic Pepper on fresh tomato slices and in mashed potatoes, with a high success rate according to my tongue! I'm planning on using their Hot & Spicy grinder today with my seafood stir-fry, and will be playing with ideas for a Hot & Spicy apple and pork roast with it as well. None of the grinders are overwhelming in one flavour or another, the ones I have used have a very good sense of balance in their ingredients and can be used in a wide range of applications. In total, I highly reccommend these grinders to those of you lucky enough to find them in your stores. They live up to their claim of being "All Natural... and All Delicious", and though I cannot personally know if they are the "World's Best" as they claim (seeing as I have not tasted every spice in the world), I know that they are in the upper ranks of my seasoning cabinet. To the company I say thank you, and suggest that they look into wider distribution for those of us not near the West Coast. Preheat oven to 375F. Lightly grease a 9” x 13” glass pan. 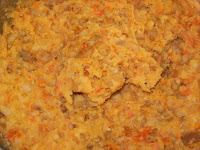 Add potatoes, sweet potatoes and carrots. Boil 30-40 minutes or until everything is very soft. 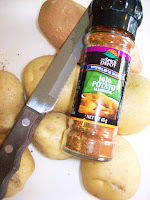 Drain and mash with 1 tsp olive oil and Jo-Jo Potato seasoning until smooth. Set aside. Pour hot broth over TVP crumbles, set aside for at least 10 minutes. Heat remaining oil in a saucepan. Add onions and cook over medium heat, stirring, until golden (about 10-15 minutes). Add jalapeno, red peppers and zucchini and continue cooking 7-8 minutes. Stir in tomatoes and rehydrated TVP. Grind in Smoky Rib Seasoning and stir. 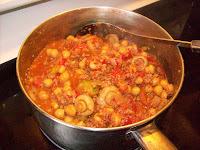 Add wine, chickpeas and mushrooms, stir and bring heat to high, cover a nd allow to cook for 10 minutes, stirring occasionally. Sprinkle in flour, stir, and cook uncovered until liquid is thickened, about 5-10 minutes. Spread a thin layer of the potato mixture on the bottom of the glass dish. 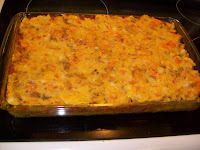 Top evenly with thickened filling mixture, followed by an even layer of the remaining mashed potatoes. Return pan to oven and bake 20 minutes longer. Pie can be frozen and reheated in a 375 oven successfully. What an interesting name for the seasoning, I have diffent grinders for spices like this. Thanks for your WHB submission.